This project seeks to bring to the forefront the incredible potential for natural resources to produce energy and fuel through processes that minimize their impact on the environment. The intervention aims to generate a spatially and chromatically variegated landscape that endeavors to engage, protect, and even restore the natural biodiversity of native plants and animals. 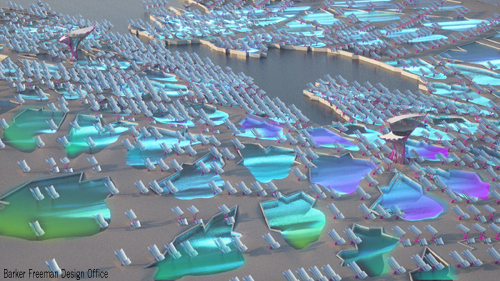 The proposal is organized as layered fields of photoresponsive energy generation systems that are also iridescent, phosphorescent surfaces intersected by a system of viewing platforms. The strategy employs local, renewable materials and resources—native algae and vegetation, recycled glass and low-tech methods of construction—to reshape the existing site into a colorful textured landscape. Modular solar collectors with parabolic trough mirrors and lightweight composite structures are made of a high quantity of recycled content. The units are designed and configured in accordance with leading examples of solar electric generation systems that successfully operate in North American desert environments. The components are then layered with iridescent coatings that reflect different fragments of the visible light spectrum. Observation towers constructed of the same material are fitted with convex mirrored reflectors to present views of the landscape on the ground and shaded viewing platforms to enable visitors to birdwatch and to observe the iridescent landscape and surrounding cityscape from an elevated vantage point. Algae Farm: A system of open saltwater ponds supports the growth of algae for biofuel production. Oils are extracted from the algae and converted to biofuel via photosynthesis, with a per-acre optimal yield of up to 10,000 gallons of oil per acre. The carbohydrate content in algae can be fermented into bioethanol and biobutanol. The north edges of the ponds are formed by retaining walls with niches for bird nests, while the south edges slope up to grade. Sandbag berms subdivide the ponds into smaller populations of algae to allow for greater control, better maintenance, and more variety of algae species to capitalize on the varied visual effects they produce in response to light. The open algae pond system is also intended as a means to attract bird species to support the goal of attracting and engaging the adjacent wildlife sanctuary. Mogul Field: The Power Station, Algae Processing Center and Visitors Center are embedded in the mogul berms toward the south that also conceal traffic and industrial park from view. The moguls begin at the southern edge of the site and gradually invert to become ponds as the pattern moves north. The shoreline is elongated and wrapped into the interior of the site to interlock the water and land together. Chromatic Phosphorescent Waterscape: Different species of algae produce different spectacular colors, and some species have phosphorescent properties that allow them to emit light at night. Water jets would be embedded to spray the pond surface to produce phosphorescent effects after dark. Solar Energy Collection System: Our proposed collection system is derived from solar energy generating systems (SEGS), a series of parabolic trough power plants in the Mojave desert at Kramer Junction, California, where solar collectors focus sun rays on an oil-filled heat transfer tube network that transports the energy to an onsite power conversion subsystem. The one we are using as a precedent is about 230,000 square meters and produces about 150 megawatts of electricity at optimum operating conditions. Iridescent Field: The reflectors are configured as parabolic sections that are paired and broken at one-third their length into two sections. The two sections vary height and angle to respond to requirements for views and shading, but primarily maintain the optimal 20 degree angle for solar collection. The reflector surface is coated with thermochromic microcapsules derived from Hypercolor technology that change color depending on temperature to broadcast “hot spots” of energy collection when viewed from above, while phosphorescent paint will allow the surface to emit a glow at night. The reflector structure is coated with Chromaflair that changes color as one moves along it. Chromaflair is comprised of flakes applied in layers of aluminum and chromium that act like a prism, interfering with the refraction of light to produce color effects. The reflector structure is to be constructed as a carbon fiber composite or alternatively steel or aluminum. The joint between the larger and smaller reflector supports has an oval bolt hole that creates a slip joint, allowing each component to translate and rotate in a limited range of motion. Bird Hide: The reflector structures are distributed along a series of control lines that follow paths through the site. 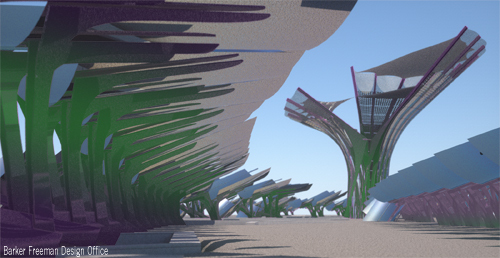 The components translate and rotate to frame views of the city and the adjacent sanctuary. They also generate a bird hide and blind system for wildlife observation that obscures observers from detection. The viewing platforms are tiered fabric-covered raked platforms that afford the visitor the ability to see the polychromatic and phosphorescent effects of the solar field and algae ponds and the spectacular cityscape beyond. The platforms are supported by a network of crossing angled carbon fiber members and are reachable by a winding stair. The structure is clad with angled parabolic mirrored panels with a convex orientation that reflect the surrounding landscape down to visitors on the ground. The panels are attached at two points so they have the ability to pivot in response to wind. They are perforated as they reach the top of the structure and become guardrails for the platforms. The environment for the proposed algae farm is ideal. Algae is naturally occurring in the climate of Dubai and is typically seen as harmful to fish and plants, although it is a staple of the flamingo’s diet. The algae ponds will be controlled and separated from the Dubai Creek by a series of concrete retaining walls and recycled-glass-filled-sandbag berms that will encourage the growth of native vegetation. This constructed groundscape should provide an appealing source of food that encourages the local waterfowl to mate and nest. Bird hides lining the northern edges of the ponds and dispersed viewing platforms are designed to conceal watching tourists from the view of the birds.